JERUSALEM -- The Israeli military shot down an Iranian drone it said infiltrated the country early Saturday before launching a "large-scale attack" on at least a dozen Iranian and Syrian targets inside Syria. 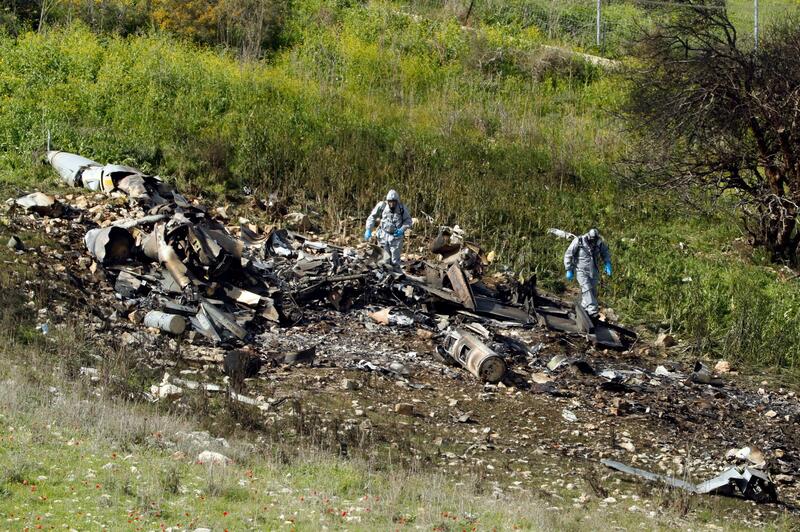 Responding anti-aircraft fire led to the downing of an Israeli fighter jet. Israel said the drone infiltration was a "severe and irregular violation of Israeli sovereignty" and warned of further action against unprecedented Iranian aggression. The military said its planes faced massive anti-aircraft fire from Syria that forced two pilots to abandon an F-16 jet that crashed in northern Israel. One pilot was seriously wounded and the other lightly. Syrian officials reported large explosions in the center of the country and the Syrian counter fire set off warning sirens throughout northern Israel. The Israeli strikes marked its most significant engagement since the fighting in neighboring Syria began in 2011 and said Iran would be held responsible for its outcome. The Israel Defense Forces tweeted Saturday, saying, "Moments ago, IAF aircraft, targeted the Syrian Aerial Defense System & Iranian targets in Syria. 12 targets, including 3 aerial defense batteries & 4 Iranian military targets, were attacked. Anti-aircraft missiles were fired towards Israel, triggering alarms in northern Israel. Gen. Hossein Salami, acting commander of Iran's Revolutionary Guard, did not acknowledge Israel's claim it shot down the drone. "We do not confirm any such news from Israel," he said. Iran's Foreign Ministry spokesman Bahram Ghasem called the Israeli claim "ridiculous." But the joint operations room for the Syrian military and its allies denied the drone violated Israeli airspace, saying it was on a regular mission gathering intelligence on Islamic State of Iraq and Syria (ISIS) militants. Syria's Defense Ministry said in statements on its website that its air defenses responded successfully to the Israeli operation and hit more than one plane. "The Israeli enemy has once again attacked some of our military bases in the southern area and our air defenses responded and foiled the aggression," it said. Prime Minister Benjamin Netanyahu and Defense Minister Avigdor Lieberman were convening the top brass at military headquarters in Tel Aviv to discuss further response. Israel has been striking at weapons stores as well as other facilities in Syria for years, the BBC reports. But the loss of a jet marks a serious escalation. The country, however, has mostly stayed out of the prolonged fighting in Syria, wary of being drawn into a war in which nearly all the parties are hostile toward it. It has recently been warning of the increased Iranian presence along its border, but military spokesman Lt. Col. Jonathan Conricus said Saturday's incident marked the most "blatant and severe violation of Israeli sovereignty" yet. He said Israel has no interest in further escalation but that it would "extract a heavy price" for such aggression. Conricus said Iran was "playing with fire" by infiltrating Israeli airspace, and said the unmanned aircraft Israel shot down was "on a military mission sent and operated by Iranian military forces." He said Israel recovered the dispatched drone, which was clearly Iranian. In response, Conricus said Israeli jets destroyed the Iranian site in central Syria that launched it. Upon their return, the jets came under heavy Syrian anti-aircraft fire and the pilots of one of the F-16s had to escape and the plane crashed. It's unclear whether the plane was actually struck or if the pilots abandoned their mission for a different reason. If the plane was in fact shot down by enemy fire, it could mark the first such instance for Israel since 1982 during the first Lebanon war. Regardless, Damascus residents celebrated the news. Wassim Elias, 39, a government employee, called it retribution for the many Israeli raids on Syrian soil before. "This earned the Syrian army and every Syrian citizen prestige. This is what we have always demanded," he said. Firas Hamdan, 42, a public servant, said such Syrian responses will ensure no more Israeli attacks in Syria. "Such attacks should be confronted and the response should be tougher to give the Israelis a lesson." The Syrian Observatory for Human Rights, which monitors the war in Syria, said Israel targeted the edges of a military air base, called T-4, in the Homs desert near Palmyra, where Iranian and Hezbollah forces are based alongside Syrian troops. The Observatory said the raids resulted in casualties, but didn't specify. It also said Israeli raids targeted areas in southwestern Damascus, bordering the southern provinces. This was followed by raids on Syrian government posts along the Damascus-Beirut road, close to the border between Syria and Lebanon. Syrian state TV said air defenses hit more than one Israeli plane and that a girl was injured when Israeli missiles fell near a school in a neighborhood in Damascus' countryside. A Syrian lawmaker, Feras Shehabi, said the response marked a "major shift in the balance of power in favor of Syria and the axis of resistance." He said "Israelis must realize they have no longer superiority in the skies or on the ground." Retired Lt. Col. Reuven Ben-Shalom, a former Air Force pilot, said the fierce Israeli response was meant not only to counter the immediate threat but also to send "very clear messages" to show Iran how deep Israel's knowledge was of its activity in Syria. The Israeli Cabinet recently held a meeting on the Golan Heights near the border with Syria to highlight new threats, which are attributed to Iran's growing confidence given Assad's apparent victory in Syria thanks to their help. Israel has shot down several drones that previously tried to infiltrate its territory from Syria. The targeting of Iranian sites in response, however, marks an escalation in the Israeli retaliation. The military confirmed that the initial target in Syria - the unmanned aircraft's launch components - was successfully destroyed.